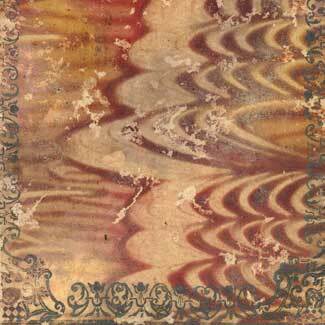 Paste papers are one of the earliest methods used to decorate paper. From the late 16th century through to the 18th century they were predominately used as book covers and as endsheets. Since the creation of paste is a relatively simple task, papers decorated with it can be found which display a wide ranging amount of complexity and skill level. Making paste includes easily obtained ingredients: Flour, water and paint. More modern artists might substitute the ground whole grain flour for corn starch and use glycerin (for consistency) amongst other discovered ingredients. Artist making these papers often devise a recipe tailored to provide the best results for their style. When trying to define types of paste papers an authority on the subject, Rosamond Loring, said that at the very least a distinction should be made ‘between those that were printed and those on which the design was made with freehand brush strokes or drawn with some tool directly on the colored, paste-covered surface of the paper.’ As a means of identifying paste papers by type we have used as our primary reference, Decorated Book Papers by Rosamond Loring. » View examples of Paste papers.